The best planet, Mercury, is in the midst of telling us something important about our sun: It’s losing mass. Mercury, the closest planet to the sun, has a history of helping us study gravity. Albert Einstein demonstrated that Newton’s laws of motion break down when dealing with very large masses. He created his theory of general relativity to account for this: gravity is a manifestation of the warping of spacetime caused by massive bodies like the sun. Mercury’s orbit shows this warping most clearly—and, indeed, before Einstein’s work, scientists were long puzzled by its strangeness, even attributing it to gravitational effects from a made-up planet called Vulcan. Now, a team of researchers in the U.S. are using new measurements of Mercury’s orbit to learn more about the sun—and more about Einstein’s theory itself. The researchers set out to perform the largest test yet of something called Einstein’s equivalence principle. As Antonio Genova, the author of the study from MIT, described the principle: “You are not able to distinguish between a uniform gravitational field and an accelerated reference frame.” It’s like when you’re in an elevator: You may feel like gravity is pulling on you more or less, but really you’re just accelerating. Testing this principle requires comparing two ways to calculate mass: one, which is based on how an object behaves in the uniform gravitational field, and another, which is based on how much force it takes to push that object. That’s basically comparing how much you weigh on Earth versus if you were in a rocket ship accelerating to perfectly reproduce Earth’s gravity (approximately 10 meters per second squared). If those mass values are the same, Einstein’s equivalence principle holds true. In this case, the researchers were interested in the center of mass of the solar system, the point that everything, even the sun’s center, travels around. The equivalence principle would hold if we measured the center’s location to be in the same place as would be predicted by the combined gravitational force of the sun on itself and the other planets on the sun. If these locations were different, it would imply that the mass of the bodies you used to calculate the location would have to somehow differ—and that Einstein’s equivalence principle would be wrong. Mercury, being so affected by the sun’s gravity, offers a way for scientists to spot tiny differences between theoretical predictions of the sun’s gravity and what we actually observe, by measuring the orbit of Mercury for a long time. Thankfully, we had the MESSENGER probe orbiting Mercury to make these calculations (it crashed into Mercury in 2015). The MESSENGER data showed that Einstein still isn’t wrong, of course. With better equipment, scientists can one day perform these tests with even more precision, and maybe find a place where measurements slightly differ from his theories. That hasn’t happened yet, though. 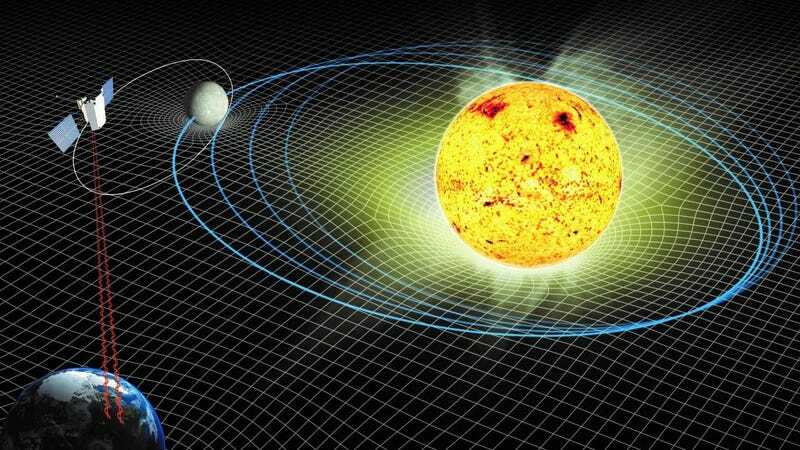 The MESSENGER team was also able to determine how the sun’s gravity changes over time—based on how it loses mass, and how that lost mass causes planets’ orbits to widen. Seven years of data, combined with observations of how the sun uses up its hydrogen fuel, reveal that the sun is slowly, every so slightly, loosening its grasp on Mercury. This was one of the “first experimental observations of the solar mass loss,” according to the paper published recently in Nature Communications. Such an effect is minuscule and could cause a broadening of Earth’s orbit equal to less than an inch a year. That’s virtually nothing and doesn’t matter to your day-to-day living. “This kind of information is not a matter of concern,” said Genova, “but could be very useful to monitor the sun itself.” Perhaps it could give researchers another way to measure the behavior of the sun’s interior. Astrophysicist Konstantin Batygin from CalTech thought the paper was “pretty sweet,” according to an email to Gizmodo. He especially liked that there was virtually no change to the gravitational constant, G, in the different measurements—another proof of gravity’s consistency. Once again, our theories have been confirmed by new precision measurements. As a reminder, all of this data comes with a spread—scientists can always achieve better certainty of the data with more measurements and better equipment. More importantly, this should remind you that Mercury is an awesome, useful planet that you should not forget. After all, monitoring it continues to support the accuracy of one of physics most important theories: the one that describes gravity.